A breakthrough in the understanding of how cosmic rays from supernovae can influence Earth’s cloud cover and thereby climate is published today in the journal Nature Communications. 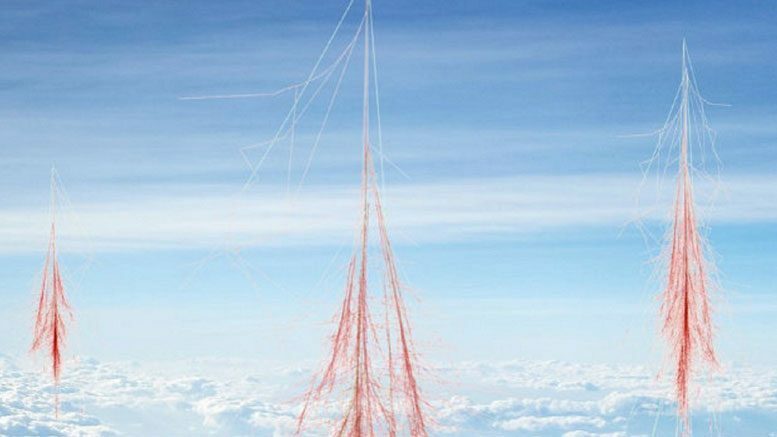 The study reveals how atmospheric ions, produced by the energetic cosmic rays raining down through the atmosphere, helps the growth and formation of cloud condensation nuclei – the seeds necessary for forming clouds in the atmosphere. When the ionization in the atmosphere changes, the number of cloud condensation nuclei changes affecting the properties of clouds. More cloud condensation nuclei mean more clouds and a colder climate, and vice versa. Since clouds are essential for the amount of Solar energy reaching the surface of Earth the implications can be significant for our understanding of why climate has varied in the past and also for future climate changes. Cloud condensation nuclei can be formed by the growth of small molecular clusters called aerosols. It has until now been assumed that additional small aerosols would not grow and become cloud condensation nuclei, since no mechanism was known to achieve this. The new results reveal, both theoretically and experimentally, how interactions between ions and aerosols can accelerate the growth by adding material to the small aerosols and thereby help them survive to become cloud condensation nuclei. It gives a physical foundation to the large body of empirical evidence showing that Solar activity plays a role in variations in Earth’s climate. For example, the Medieval Warm Period around year 1000 AD and the cold period in the Little Ice Age 1300-1900 AD both fits with changes in Solar activity. “Finally we have the last piece of the puzzle explaining how particles from space affect climate on Earth. It gives an understanding of how changes caused by Solar activity or by supernova activity can change climate.” says Henrik Svensmark, from DTU Space at the Technical University of Denmark, lead author of the study. Co-authors are senior researcher Martin Bødker Enghoff (DTU Space), Professor Nir Shaviv (Hebrew University of Jerusalem), and Jacob Svensmark, (University of Copenhagen). The fundamental new idea in the study is to include a contribution to growth of aerosols by the mass of the ions. Although the ions are not the most numerous constituents in the atmosphere the electro-magnetic interactions between ions and aerosols compensate for the scarcity and make fusion between ions and aerosols much more likely. Even at low ionization levels about 5% of the growth rate of aerosols is due to ions. In the case of a nearby super nova the effect can be more than 50% of the growth rate, which will have an impact on the clouds and the Earth’s temperature. To achieve the results a theoretical description of the interactions between ions and aerosols was formulated along with an expression for the growth rate of the aerosols. The ideas were then tested experimentally in a large cloud chamber. Due to experimental constraints caused by the presence of chamber walls, the change in growth rate that had to be measured was of the order 1%, which poses a high demand on stability during the experiments, and experiments were repeated up to 100 times in order to obtain a good signal relative to unwanted fluctuations. Data was taken over a period of 2 years with total 3100 hours of data sampling. The results of the experiments agreed with the theoretical predictions. Cosmic rays, high-energy particles raining down from exploded stars, knock electrons out of air molecules. This produces ions, that is, positive and negative molecules in the atmosphere. The ions help aerosols – clusters of mainly sulphuric acid and water molecules – to form and become stable against evaporation. This process is called nucleation. The small aerosols need to grow nearly a million times in mass in order to have an effect on clouds. The second role of ions is that they accelerate the growth of the small aerosols into cloud condensation nuclei – seeds on which liquid water droplets form to make clouds. The more ions the more aerosols become cloud condensation nuclei. It is this second property of ions which is the new result published in Nature Communications. Low clouds made with liquid water droplets cool the Earth’s surface. Variations in the Sun’s magnetic activity alter the influx of cosmic rays to the Earth. When the Sun is lazy, magnetically speaking, there are more cosmic rays and more low clouds, and the world is cooler. When the Sun is active fewer cosmic rays reach the Earth and, with fewer low clouds, the world warms up. The coolings and warmings of around 2oC that have occurred repeatedly over the past 10,000 years, as the Sun’s activity and the cosmic ray influx have varied. The much larger variations of up to 10oC occurring as the Sun and Earth travel through the Galaxy visiting regions with varying numbers of exploding stars. Be the first to comment on "How Cosmic Rays from Supernovae Influence Earth’s Cloud Cover"